Whenever John (not his real name) entered my class, we had to open the windows. He smelled really bad, most of the time. He also wasn’t in class very often, and I never knew when he would be school, and when he wouldn’t be in school. There seemed to be no rhyme or reason to his attendance. When John did attend class, he had to be given a new pencil and book in order to write down any notes or work any math problems. Eventually, I just kept a pencil and a notebook in class for him since he never did any homework. He was an attentive and bright student, but he missed so many classes that he struggled to keep up. In fact, "keeping up" became impossible for John. When he wrote tests, he would do the questions nearly flawlessly that he had seen in class, but there were rarely enough of these kinds of problems for John to demonstrate mastery of the curriculum. In about February of the year, John stopped coming to class, and I never found out what happened to him. I was talking to one of my colleagues about John, and she mentioned he was homeless, and I felt completely embarrassed that I never realized. John is not alone. 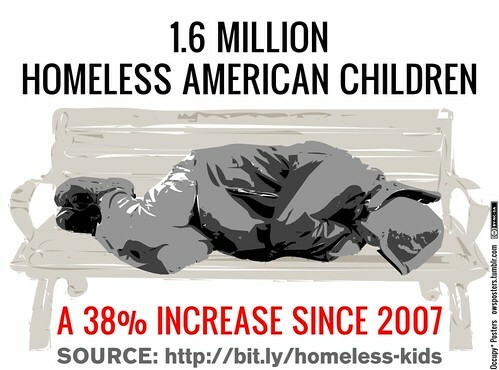 There were 1.6 million children in the United States in the year 2011 who experienced homelessness for at least part of the year. Many of these children struggle in school because of issues similar to what John experienced, and then continue to suffer throughout their lives in the vicious circle that is poverty. I suggested to someone recently that we should build schools, especially in areas likely to be high risk, to be more like community centres, with access to health-care, food services, emergency shelters, social services, and after school care programs all under the same roof. Services for children could then be managed centrally by the school and the odds that a child could slip through the cracks and not get what they needed would be diminished. It would also be a lot less expensive than the current emergency-room health care system in the United States. The response of the person was basically along the lines of "It’s the parent’s fault. They need to be more involved." To this I respond, we should not punish children for the periodic inability of their parents to make their lives work. If we are to be a humane society, then all children in our society should be cared for, whether or not their parents are always able to provide this care. John’s story is heartbreaking. The worse thing is that I have met a few Johns, and Joans, more in fact than I wanted to, and yet fewer than I wished to. I’ve taught at outreach schools run close to the centres you propose, where students are at risk and several are homeless. These are great kids with tough lives, often through no fault of their own. They are wonderful to teach, and are as motivated or more so than most students a teacher might meet. Life and immediate cares just get in their way. It is hard to work for your future when you are struggling to work for (keep) your present. My first John was a bright boy who told me one day he was having difficulty concentrating because he hadn’t eaten in three days. I thought he was participating in a charity hunger marathon and, hoping to strike up a social-conscious conversation with him, asked him what he was on strike for. I was definitely shocked by his answer. His father was paying for his extra education (Sylvan Learning in this case), but did not have enough money for food. My banana that I offered seemed inadequate, but I never forgot that shock. You just described about 30% of my students…sadly. (I teach on a Reservation.). Even on a Rez where there is free health care and social services just down the road, the bureaucracy is infuriating. I once called CPS for a student with two black eyes delivered by her mother. The social worker tried to refuse to take my report because I didn’t have an address for the mother. Still, we do our best. I would add that in high need communities, we cannot allow the circumstances in which our students live to lower our standards. For example, my school purchases and distributes school supplies for all our students. Even so, many of our students refuse to carry a pencil or pen from class to class. The first hour teacher provides a pencil, the student throws it in the garbage or snaps it at the end of the hour. Same story in hour two and so on. When asked about ti, the student will commonly reply, “so and so will just give me another next hour”. We need to balance support with the fear of providing a crutch.